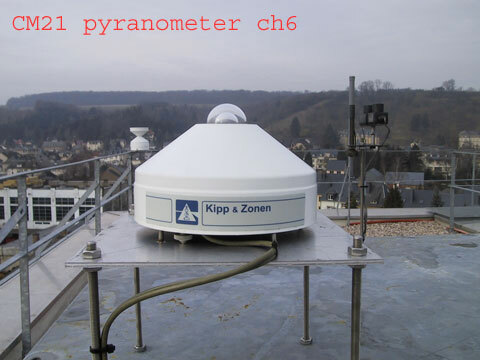 This file contains all relevant information concerning the meteorological station of the LYCEE CLASSIQUE DIEKIRCH (LCD). Previous readme.html files are here, here, here, here , here. 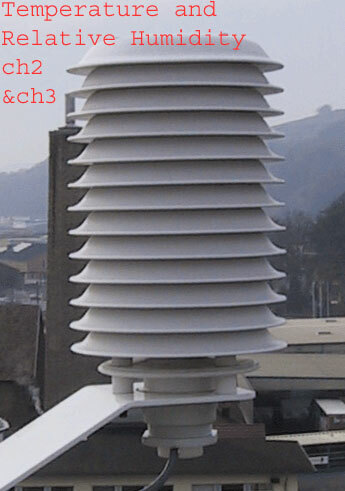 The gas sensors for O3 and NO2 have been replaced by miniature CAIRSENS sensors (sensor O3&NO2 and sensor NO2). All computers are synchronized to Internet time servers. 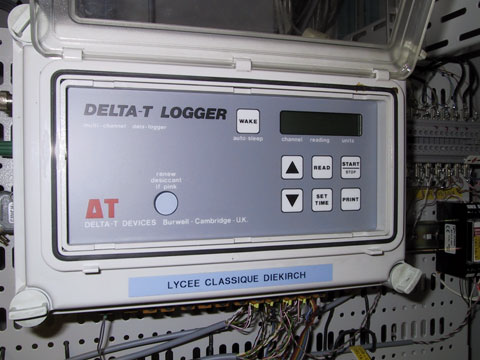 Typically every minute, with average of 30 minutes stored in logger. 61 AN1 AirSpeed [m/s] air speed measured by cup-anemometer accuracy 1%; treshhold 0.2 m/s; digital output; older model; used as spare. 4 AN3 Air_Velo [m/s] Air speed measured by ultrasonic anemometer; accuracy 0.1 m/s. 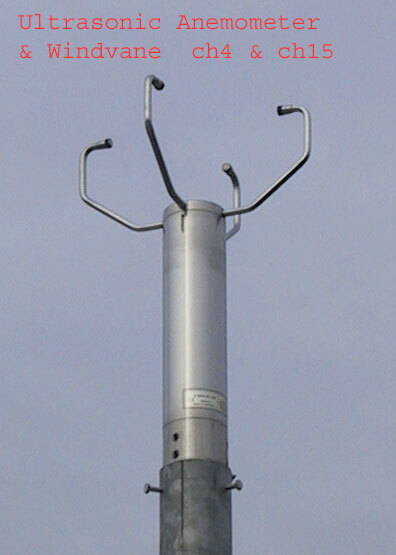 Former model by THIES Clima has been replaced the 08 July 2013 by a Windsonic model from GILL Instruments Ltd, UK. The accuracy of the Windsonic is 2% at 12 m/s. See picture here. ( milli-Minimal-Erythemal Dose per hour) 1 MED/h = 250 J/(m2*h) = 0.06944 W/m2 effective UVB irradiance This precision broadband instrument is temperature-stabilized at 25 degrees Celsius. 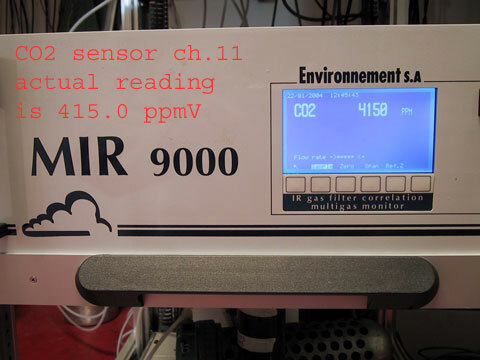 11 CO2 c(CO2) [ppmV] CO2 concentration of the air, expressed in ppmV (parts per million; 1 volume% = 10000 ppm). Original Teledyne API E600 sensor replaced on 256 June 2017 by diffusive GMP343 sensor from Vaisala (dual beam NDIR). 13 WV2 Windvane Mechanical windvane. 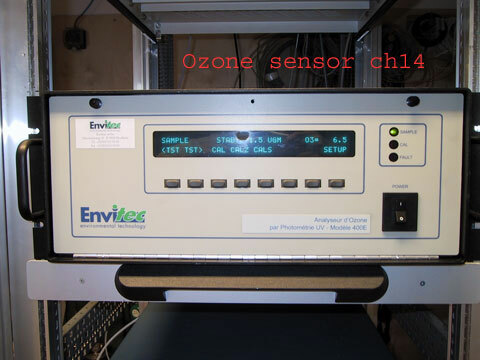 DELTA_T Devices Ltd.
14 (removed) OZO Ozone [ug/m3] Tropospheric ( = ground) ozone concentration in ug/m3 measured by the old O341M, as the old API Teledyne 400E sensor went defunct. 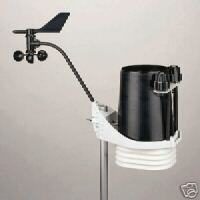 15 WV2 Wind_Dir [degrees] Ultrasonic Windvane (same device as ch.4); accuracy 1� THIES Clima. 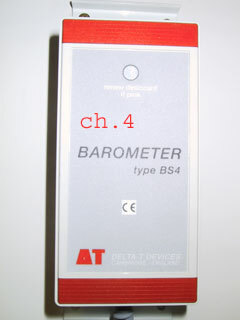 Former model by THIES Clima has been replaced the 08 July 2013 by a Windsonic model from GILL Instruments Ltd, UK. 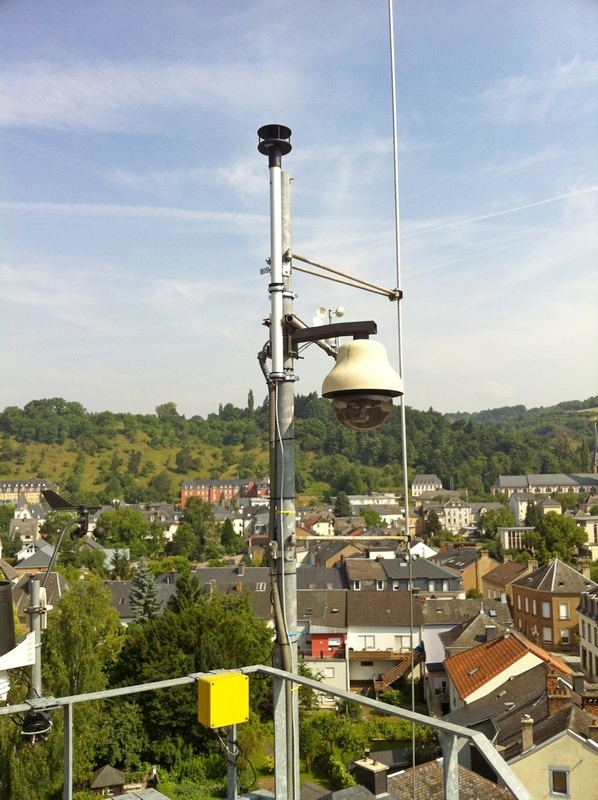 The accuracy of the Windsonic is �3� at 12 m/s, resolution is 1�. 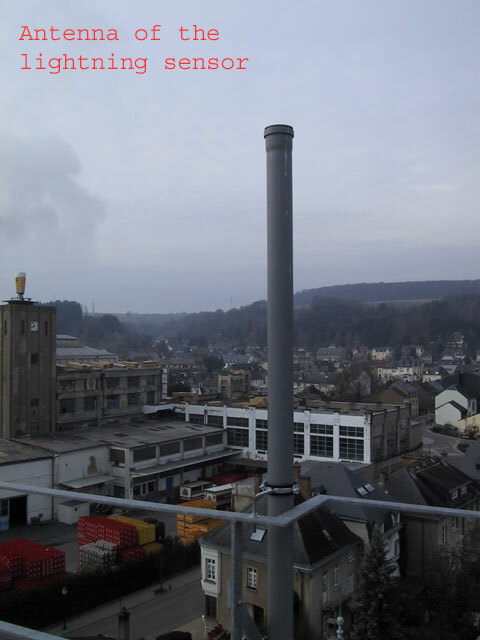 16 AQ c(NO2) [ug/m3] AQ = Air Quality measured by CAIRSENS =3&NO2 sensor from Environnement SA. No pressure nor temperature correction! UART model with analog 0-5 V used by the logger. 5V = 250 ppb = 500 ug/m3. 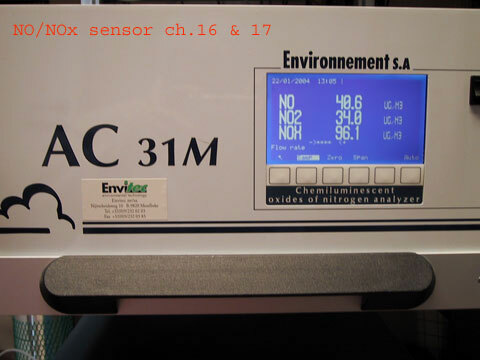 17 NO2 c(NO2) [ug/m3] CAIRSENS =NO2 sensor from Environnement SA. No pressure nor temperature correction! UART model with analog 0-5 V used by the logger. 5V = 250 ppb = 500 ug/m3. [O3] = ch.16 -ch.17. 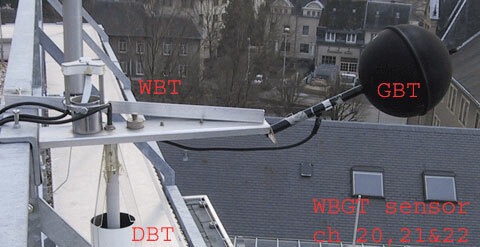 Attention: Lower limit of detection is about 100 ppb = 20 ug/m3 ! ENVIRONNEMENT SA. 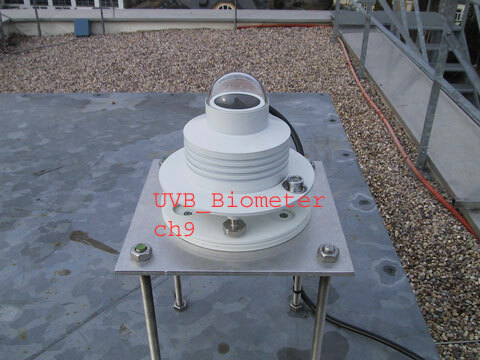 18 UBT UVB_Tin [C] Internal temperature of UVB_Bio sensor. 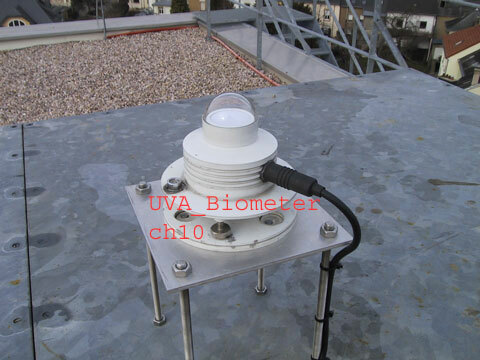 Should be close to 25 degrees C.
19 UAT UVA_Tin [C] Internal temperature of UVA_Bio sensor. 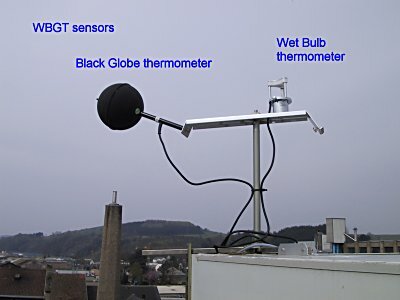 Should be close to 25 degrees C.
20 GBT Globe_T [C] Black Globe temperature sensor for the computation of the WBGT (Wet Bulb Globe Temperature = Heatstress-Index) . Installed 02_May_01. 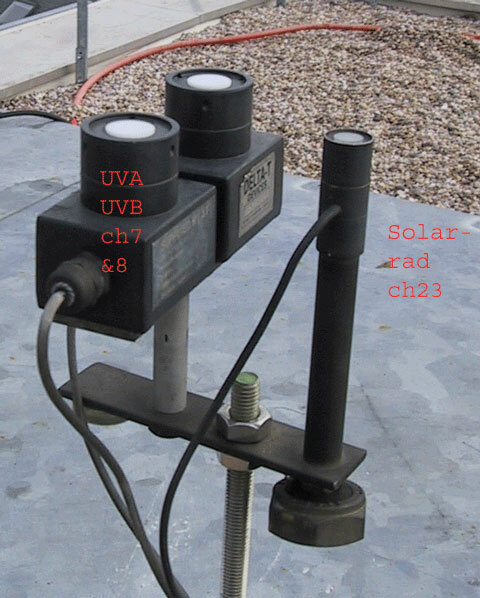 23 ESR SolarRad [W/m2] Solar radiation (irradiance) in W/m2; CM21 high precision ventilated pyranometer (old model that was used previously at channel 6. Replaced by SMP10 the 5th June 2015). 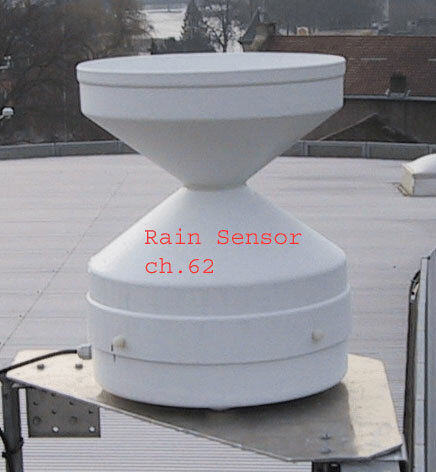 Sampling for most sensors : 1 per minute, average over 30 minutes stored. 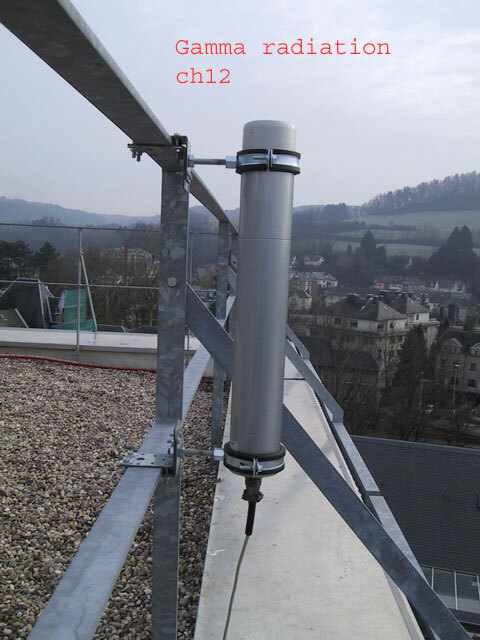 DAVIS VANTAGE PRO2 PLUS This is a complete selfcontained backup weatherstation, with temperature, humidity, rainfall, local air pressure, windspeed/direction, solar irradiance and UVB sensors. It will be used mainly as a backup in case of dramatic failure of the main station. Data-files usually cover a whole month, and contain 31*48 + 21 = 1509 lines for 31-days months (header = 21 lines). The graphs are made using a Linux system (HP thin client with Lubuntu), running GNUPLOT and IMAGE MAGICK and many self-written Perl scripts. A XPe computer running AUTOMATE 5 Pro makes the transfer from the logger to the Linux computer (transfer 2 times per hour); the Linux computer makes the daily and global files, creates the graphs and icons and transfers everything to the Internet provider.